Are you as excited as we are? Our Paws & Give delivery of extra delicious Dog & Cat Advent Calendars has arrived! Now you can include your pup AND kitty in your holiday celebrations. With 24 days of treats from Nutrience, each day comes with three freeze-dried beef liver treats, so the calendar can be shared with multiple pets in your house! Limited quantities are available, so order soon to avoid disappointment! You’ll treat the pets in your life and help animals receive their second chance at a great life. Thank you to all sponsors, participants, donors and furry friends that took part in the 2017 Ontario Friends for Life! Walk™ presented by Pedigree®. Because of all the support we received, we were able to raise over $260,000 this year! These funds will help animals across the province and will increase their chance at finding a forever home. Top Adult Fundraiser: Lee D. who raised $8,694! Top Youth Walker Fundraiser: Kennedy S. who raised $675! Top Corporate Team Fundraiser: Euro Tile & Stone who raised $10,200! Top Community Team Fundraiser: Team OpPURRtunity- Renfrew County Staff & Volunteers who raised $15,236! Congratulations to all of our deserving fundraisers and THANK YOU for all of your hard work! Don’t miss out on all the fun that happened at our FFL! Walk event locations – visit our Facebook page and find your photo from the day. Stay tuned for details on the 2018 Ontario Friends for Life! Walk™ in the upcoming months! The Ontario SPCA is excited to celebrate Registered Veterinary Technicians (RVTs) all month long. RVTs are an integral part of any animal health care team, but they are particularly valuable in a shelter environment. These skilled, trained professionals offer support on how to manage the animals in our care and confidently provide their expertise in terms of medical advice and next steps. Join us in celebrating and thanking all of our hard-working RVTs out there making a difference! Visit our blog to learn more about RVTs and their role in animal care and shelter medicine. Halloween can be a stressful time for your pets. Whether you are dressing up your furry friend or staying home handing out treats, the hubbub of activity can be exciting and a little scary. If your pet is a little weary of strangers coming to the door, it might be best to keep them in an enclosed room or crate. Pet costumes should also fit appropriately and have no small bits to chew. Most importantly, candy and chocolate can be fatal if ingested. Please ensure treats are kept safely away from your pets. 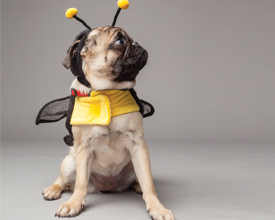 Keep your pets safe this Halloween by visiting our blog for more great tips. 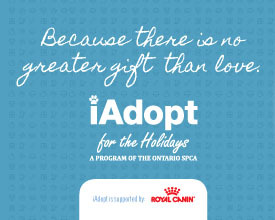 The Ontario SPCA is gearing up to find homes for as many animals as possible during “iAdopt for the Holidays”. From November 1st to December 31st, SPCAs, Humane Societies, rescue groups and animal welfare groups across Canada will be encouraging people to choose pet adoption as their first option when bringing home a new family member. Watch for the campaign launch on November 1st and stay tuned for exciting contests, adoption stories, photos and more during iAdopt for the Holidays. Thank you to everyone who entered the Name the Foal contest last month. With nearly 500 entries, we received many fantastic suggestions and the judges had a difficult time selecting a winner. After much deliberation, we are please to announce the winner of the contest and recipient of the Green Hawk $100 gift card and prize pack. 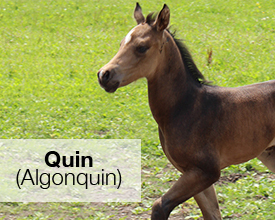 Congratulations to Marj Burnette of Gravenhurst for naming our sweet foal Quin (Algonquin). We hope you enjoy your prize!